The spring adventure pathway goes right through the hillside spring moor. With a little luck, visitors can see an Alpine Planarian Worm. This species has been found here since the last Ice Age. The spring adventure path takes you on a 135-metre-long wood-plank pathway through the middle of a hillside moor directly to a hillside strata spring with neighbouring forests and spring marsh. 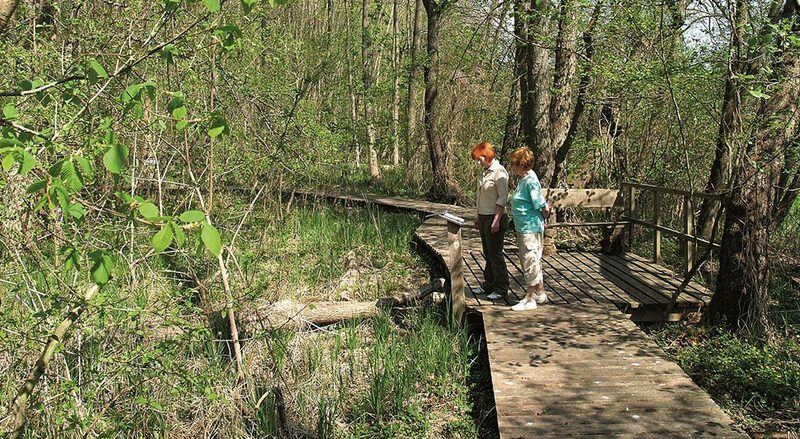 It invites the visitors not only to look at the typical marsh plants like the Marsh Marigold with its intense yellow blossoms or the Ash, Alder and European White Elm that line the plank pathway. It encourages you to discover nature and sends you on a quest to find an Ice Age relic, also known as the Alpine Planarian Worm. At the small spring, which emerges from a slope, you can take sediment from the spring marsh in a sieve and observe it with a magnifying glass. With a little luck, you will find the Alpine Planarian Worm, an animal from the family of flatworms, whose specimens have lived here since the most recent Ice Age. The Alpine Planarian Worm can grow up to one and a half centimetres long and feeds mainly on freshwater shrimps. If you are hiking on the spring adventure path, you can learn much more about the Ice Age that has shaped the forest landscape south of Criewen. On information boards, you learn interesting facts about the features of this spring forest that is located on the edge of the Densen Mountains. More than 15,000 years ago, the glacier edge was here, which compressed the landscape together by alternatingly advancing and retreating and pushed it upwards. This resulted in the typical Uckermark rolling hills, and with their different habitats offered space for a variety of animal and plant species. Moist biotopes alternate with dry elevations. The highers hilltop of the Densen Mountains rises 30 metres high above sea level. 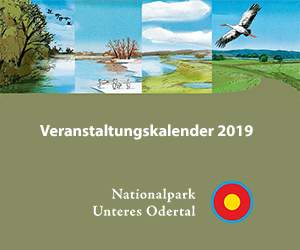 The forest belongs to the wilderness area of the Lower Oder Valley National Park. The spring adventure path is part of a network of hiking trails that runs southward from Criewen and opens up the Densen Mountains as well as the floodplains of polders A and B. The seven-kilometre “Wild Forest Trail” goes through the spring forest, rounds the Densen Mountains and leads back to Criewen. The spring adventure path can also be reached via the “Path of Floodplain Views”. This also leads into the Densen Mountains, crosses the Hohensaaten-Friedrichsthaler Waterway and goes along the edge of the Oder floodplain back to Criewen. There, at the start and finish point of these trails, hikers can visit one of the most beautiful parks in the Uckermark, the Criewener Lenné Park. The National Park House is also found here, where you can learn about the Lower Oder Valley National Park in a permanent exhibition. Among other things, visitors can use the polder model to learn how flood protection works in the Lower Oder Valley. Over 100 years ago, huge areas were dammed up following the Dutch model, where the river can spread out undisturbed during floods. A large aquarium makes the underwater world of the Oder’s lower reaches visible.